Mac Foiled Shadow in Joy Toy, limited edition: Photos don't do this champagne-gold eyeshadow any justice whatsoever. It's stunning. I'm not sure if Mac have bought out the foiled shadows before but they're such a lovely formula. Silky smooth, super pigmented and they have an eye brightening effect. There are some unusual colours in this formula but you can't go wrong with the neutrals. Side note: This picture's deceptive because the pan of this would easily be double the size of a standard Mac eyeshadow. Just keep that in mind. 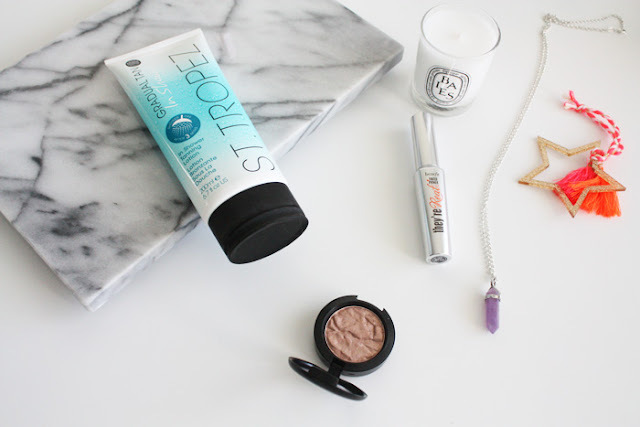 St Tropez In Shower Gradual Tan*: Aside from the time I overzealously applied this and ended up with orange shoulders (yep...skilled), I can't fault this one. It's a great tan enhancer and something convenient to whip out if you're paler and don't want to faff around with full on tanners. Provided you don't exfoliate too often the colour does last a good three or four days before you need to fix it up. It doesn't have that awful fake tan smell either. Bonus. Benefit They're Real Lash Primer, available January 29th*: I've tried a couple of lash primers lately and this one is by far my favourite. Rather than being a white liquid, this one's mink brown so it looks a lot less severe on the lashes. You can wear it alone which looks amazing and I've been told by my friends that it looks like a mascara on the lashes. It really works its magic when paired with other mascaras though. I've tried it with several and it seemed to make them all look more amazing. Witchcraft perhaps? I'm impressed regardless. Amethyst Crystal Necklace x Shop Style Conquer: After my clear quartz pendant broke (RIP), I was looking for another crystal pendant to buy and I loved the look of this one from Tara and Ellen's online shop. Let's be real, I could've bought one of the others they have too though, they're all amazing. I like longer necklaces because I feel like shorter ones emphasise my nonexistent neck and I prefer the way longer chains sit. This looks lovely on its own and layered with other daintier pieces. I do love me some versatile jewelry. Hourglass Ambient Lighting Bronzer in Luminous Bronze Light: This is such a Summer favourites post isn't it? Bronzers aplenty. This one's on the pricier side of things but it's huge and will last ages. I love how the colour is more pale skin friendly as well. You can't go wrong with Hourglass's powders. It's a bold claim but they have to be some of the best of the bunch. L'Oreal Infallible Matte Foundation*: After temporarily losing this foundation, I finally found it again and have been loving it. The aforementioned humidity loves to destroy my makeup and leave my skin as luminous as a CD, so matte bases and mattifying powders are my best friend. 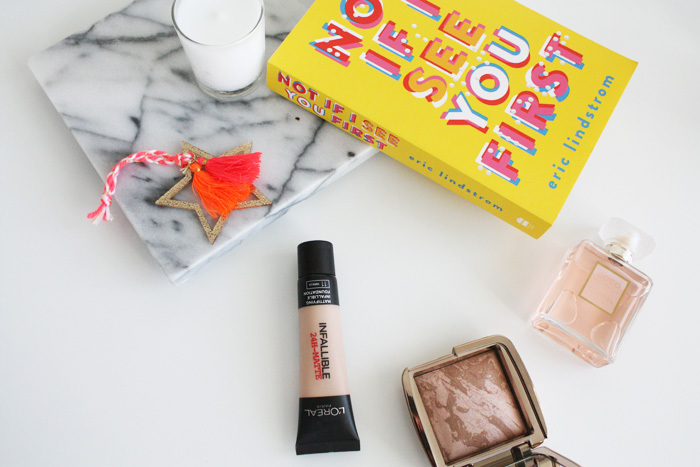 I have Vanilla, the palest shade which seems to suit my skin fine at the moment but I love the formula of this and how flawless it leaves your skin looking. 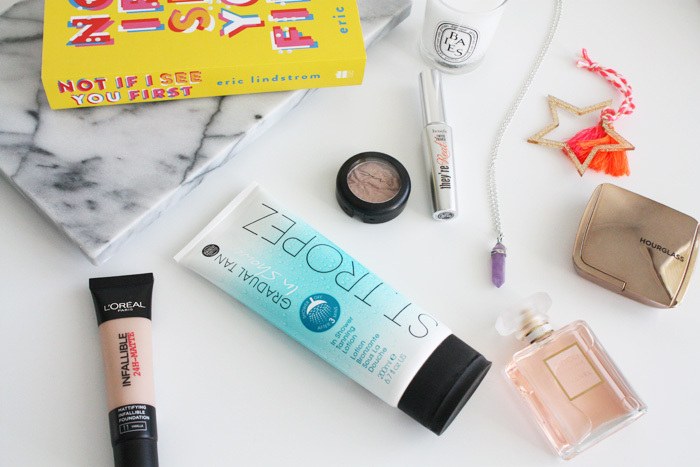 It's perfect for combination or oily skin types. Sisters: This. Film. Though. I went and saw this with Fiona a couple of weeks back and we loved it. I'm probably a bit biased because I do have a lot of love for Tina Fey and Amy Poehler but it is hilarious. There's also a ton of SNL cast members in the ensemble cast who all deliver. The dialogue is brilliant and the acting is superb. Do not be surprised if you are crying with laughter during this one. Coco Mademoiselle Eau De Parfum x Chanel: Coco Mademoiselle is such an iconic fragrance and I wouldn't be surprised if it's not one of the bestselling fragrances of all time. I'm terrible at describing fragrances so this one is from Fragrantica: Top notes of Coco Mademoiselle Parfum incorporate Sicilian oranges, Calabrian bergamot and Sicilian grapefruit. A floral heart is created of pure rose extract and pure jasmine extract, along with a fruity touch of litchi, while its base notes carry a combination of Indonesian patchouli, Haitian vetiver, Bourbon vanilla ad white musk. It's luxurious, lovely and so longwearing. Even though this is quite expensive, you barely need to spritz any so you can be guaranteed a bottle will last you ages. This is easily one of my favourite perfumes ever so hell will break loose if it's ever discontinued. For real. Not If I See You First* by Eric Lindstrom: There could've easily been a few books in here this month but this one stood out to me the most. It's the story of Parker, a vision impaired teenage girl and her life as a high school student+young woman trying to make her way among the chaos that is life. It's funny, sad, heartwarming and all round brilliant. I really loved this book and gave it five out of five stars over on Goodreads. It was such a strong novel to start the year with. -What have you loved in January?